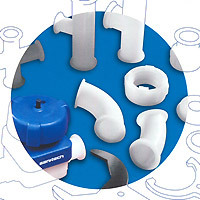 Most Sani-Tech® Sani-Pro® components are reusable and reconfigurable. Complete process control is gained through simplicity of design, consistency of contact surface, as well as uniformity of flow criteria within all flexible and rigid products. If you have a demanding application and cannot find the right product within this catalog, please contact us to discuss it! Sani-Tech West specializes in solving these unique application and process problems.